LOS ANGELES -- (April 18, 2018) – Dunn-Edwards, one of the nation’s leading manufacturers and distributors of premium architectural, industrial and high-performance paints and paint supplies, has introduced ENDURACAT™, an epoxy-fortified interior, ultra-low VOC, pre-catalyzed, water based, single component coating. Enduracat is intended for use on properly prepared interior metal, wood, drywall and masonry, and provides superior adhesion, excellent chemical resistance, and outstanding washability. Enduracat is available in Semi-Gloss; L, M and U bases; and in one-gallons. Click for more information and technical spec sheets. 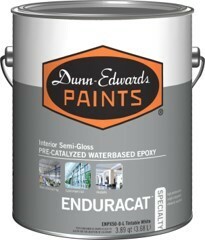 Like all Dunn-Edwards paints, Enduracat does not contain ethylene glycol (EG). Dunn-Edwards removed EG from its paint formulas in 1984 and remains the only major manufacturer to have done so. EG, which is listed as a hazardous air pollutant and toxic air contaminant, can be harmful to humans.